Humans (and other races) call them "halflings," and tend not to take the little folk too seriously. They look like children, so they get treated like children?distrusted, underestimated, or just plain ignored. Separate DM and player's booklets — 96 pages in all! GAZ8: "The Five Shires" (1988), by Ed Greenwood, is the eighth book in the "GAZ" series of Gazetteers for the Known World. It was published in September 1988. Origins. By 1988, Greenwood was already working hard on Forgotten Realms sourcebooks and novels. However, when Bruce Heard asked him to write "The Five Shires", as part of the rapid expansion of the Known World, he was happy to contribute. Greenwood approached "The Five Shires" as a world designer. He opted to create a "golden land of plenty", in contrast to the more violent and unstable countries that filled the Known World. The trick was then to place danger and adventure within this seemingly utopian landscape. Famous Personalities! While driving across Canada, Greenwood chanced upon a hobby store in rural British Columbia just as "Five Shires" was released. He accidentally outed himself as the author by quoting a paragraph for a young customer who found his copy marred by an ink blotch. Afterward, the GAZ fan ran out and told the whole town about the author's presence; Greenwood found himself signing many autographs on diner napkins before he and his wife fled. Continuing the “GAZ” Sourcebooks. "The Five Shires" continued the "GAZ" series of geographical sourcebooks for the Known World. Like its immediate predecessors, "The Five Shires" contained two books, one for players and for GMs; the players book contained lots of crunchy game bits, while the GMs book was full of fluffy source material. 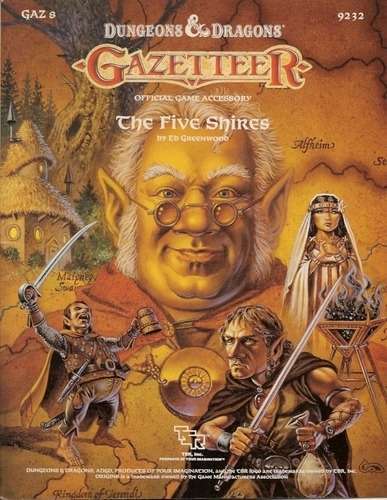 "The Five Shires" was also the third of the race-oriented "GAZ" sourcebooks, the previous two being GAZ5: "The Elves of Alfheim" (1988) and GAZ6: "The Dwarves of Rockhome" (1988), both published earlier in the year. Expanding Basic D&D. As with many of the later "GAZ" books, "The Five Shires" contains expansions to the Basic D&D rules. Most importantly it includes a new halfling subclass, the Master, who can go up to 35th level, where normal halflings were limited to 8th level. "The Five Shires" also describes a special "denial" ability available to halflings in the Shires, has mechanics for influence and clans, and expands the blackflame rules originally found in the D&D Companion Set (1984). A History of Halflings. Halflings first appeared in OD&D (1974) as hobbits, clearly borrowed from J.R.R. Tolkien's Lord of the Rings (1954-1955). However Elan Merchandising, who held Tolkien rights in the US, objected to TSR's use of Tolkien material and sent them a cease & desist in late 1977. Hobbits became halflings, but still remained very hobbit-like. The main exception was in the world of Krynn (1984+) where halflings became the child-like kender. Halflings have never been as popular as dwarves or elves, so there weren't any major halfling sourcebooks from TSR prior to "Five Shires". Unsurprisingly, the halflings described here are still hobbit-like, with a rural country full of pipe smokers. However, "Five Shires" also details highwaymen and pirates, giving some variety to its halfling people. Greenwood also introduced a new name for halflings — hin — which allowed him to save space in the manuscript. Half-a-decade later, TSR would release PHBR9: The Complete Book of Gnomes & Halflings (1993), their first generic look at halflings (and gnomes). Expanding the Known World. "The Five Shires" expands on an area of the Known World that hadn't previously received much attention. Greenwood's detailed descriptions of individual communities within the Shires, complete with smaller scale maps of the areas, is reminiscent of his later work on the Volo's Guides (1992-1996, 2000) for the Forgotten Realms. Many of the Known World setting books are linked to real-world countries. "The Five Shires" has the rural feel of the British countryside, though it doesn't seem connected to any specific part of the British Isles. "Sure. Superimpose the Luiren cities and government structure, shift places 'just a little' to make room for them, and, yes, it works admirably for that. Almost as if someone designed it that way." Expanding the Outer Planes. "The Five Shires" also touches upon the unique cosmology of Mystara by connecting the Halfling's blackflame with the Sphere of Energy. Future History. Greenwood wrote specifically about the halflings of the Realms in "Hin Nobody Knows" for Dragon #269 (March 2000). About the Creators. This was Greenwood's second non-Realms book for TSR, following CM8: "The Endless Stair" (1987) and preceding SJR1: "Lost Ships" (1990). By 1988, Greenwood was extensively writing Realms books for TSR, with his first novel, Spellfire (1988), being his most notable release for the year. Can this be print on demand? Print on Demand please :-) .